the indolent cook: day trip to rottnest island: quokkas and more! The quokka's irresistible signature smile. 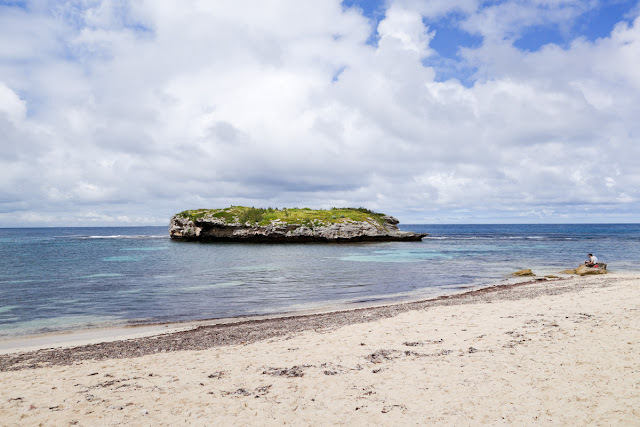 Earlier last month, Simon and I did a day trip to Rottnest Island. It was my first time there, and also Simon's, even though he grew up in Perth! So it was all rather exciting. We'd seen the popularity of quokka selfies on the internet, and we were all wrapped up in the giddy anticipation of getting our first real-life glimpse of these adorable marsupials. So I went there thinking all I wanted to see was quokkas, and I did and it was everything I could hope for - but you know what, I fell in love with more than that. One of the many salt lakes at Rottnest Island. 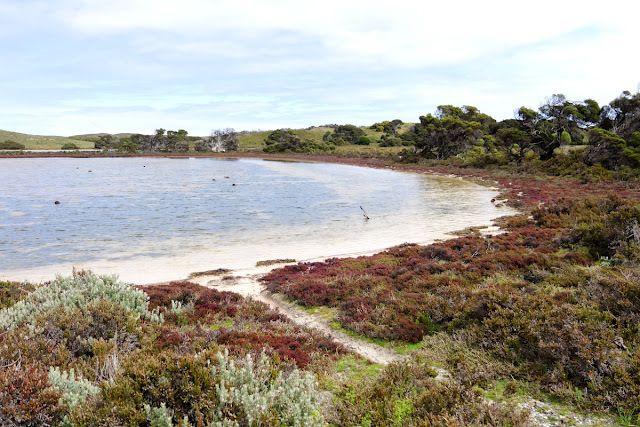 Quite sure this one is Pink Lake, though it may possibly be Lake Negri. But let's get back to the beginning. First, we hopped on a ferry at Fremantle. Here's my first tip - there is usually some deal going on, so check the ferry operator websites and book according to the instructions to secure your special rates. You could potentially score a free ride for your birthday, or highly discounted fares on Tuesdays, for example! My second tip? The ocean may or may not play nice - our ferry trip over there made me feel quite ill, while the trip back was perfectly fine - so, get your seasickness remedies ready, just in case. 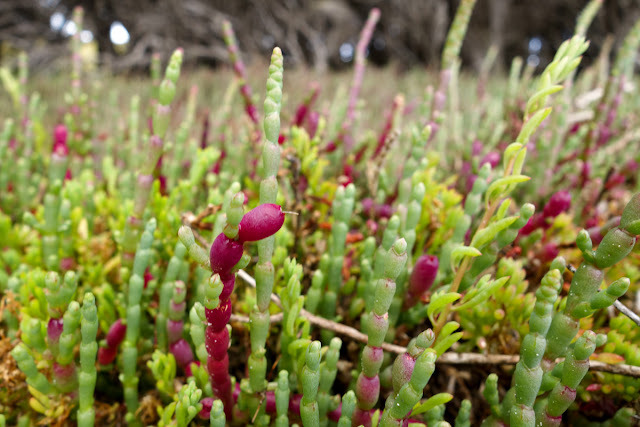 Ducklings stroll through the colourful vegetation at Rottnest Island. Awesome camouflage! 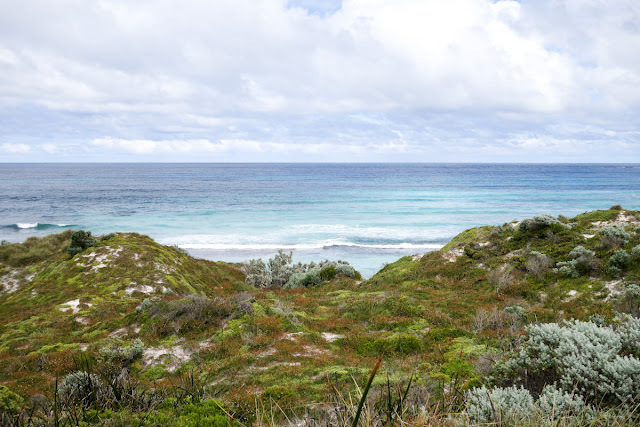 We started cycling around Rottnest Island, and seriously, it took my breath away. It was so beautiful everywhere we went, I think I might be bold enough to say that this is the prettiest place I've ever visited in Australia. Lush samphire at Rottnest Island. Fabulous ocean views at Rottnest Island. 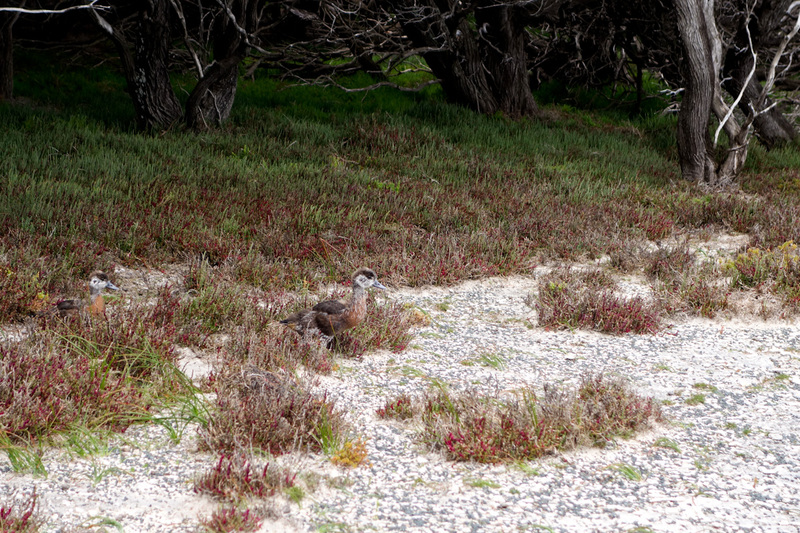 But as we cycled along, I did get a little bit concerned, as other than our initial sighting of quokkas outside the bike shop, we haven't really seen many others hopping around. Additionally, Rottnest Island is quite hilly, and as someone who rarely cycles, at certain points, despite all the beauty around me, I couldn't help but bleat plaintively. This is a selection of oft-quoted phrases whilst I cycled around the island. 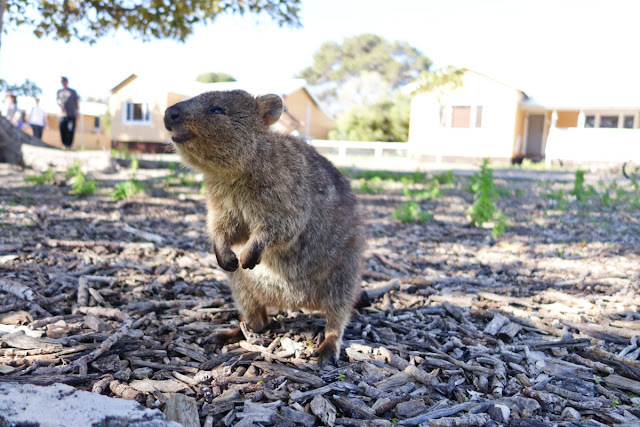 "There are 12,000 quokkas on this island, where are they?" "Come out and love us, quokkas!" And during my strenuous uphill battles - "This is killing me..." "I'm so tired..." "I'm dying..."
Oh, and "Strugglesome..." a new made-up word coined by Simon that I adopted with gusto. 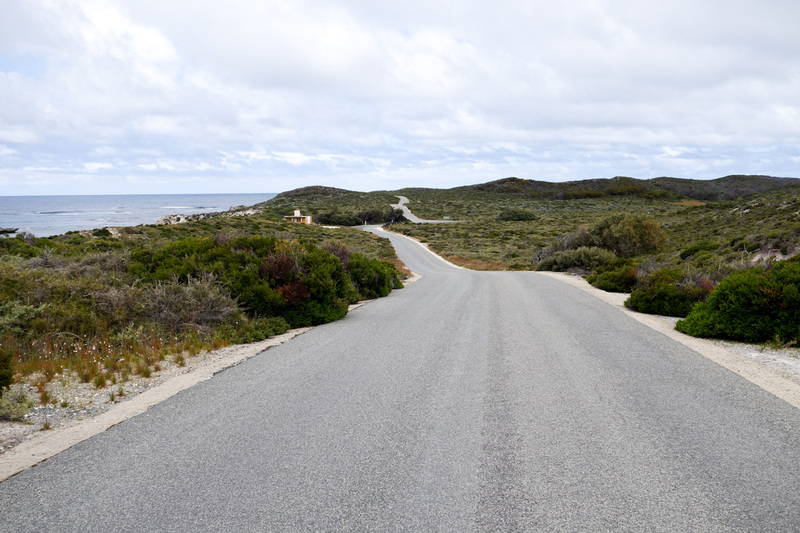 The hilly paths of Rottnest Island are perhaps not the most ideal for unfit cyclists like me. We packed bananas, almonds, and water for this day trip, and after a couple of hours exploring the island on bike, we were ready to plonk ourselves down for a good resting and snacking session. We did just that at the Nancy Cove beach, taking in sweet views of Green Island as we rejuvenated ourselves. The beach at Nancy Cove has a great view of Green Island. With newfound energy, we continued on our merry way. More scenic loveliness ensued. Sensational views at Little Salmon Bay, Rottnest Island. It was mid-afternoon when we stumbled upon another party of quokkas. Look, I have no idea what the collective noun is for quokkas, but they're so cute that my heart does a little dance when I see them, so a party sounds appropriate. At the time we went - the month of October - we saw some young quokkas hopping around, and they are so adorable! If you want to see baby quokkas still in their mothers' pouches, then probably May to August would be a better time to visit the island. But really, they're cute at any age, so I'd say you can't go wrong as long as you go on a day with decent weather. 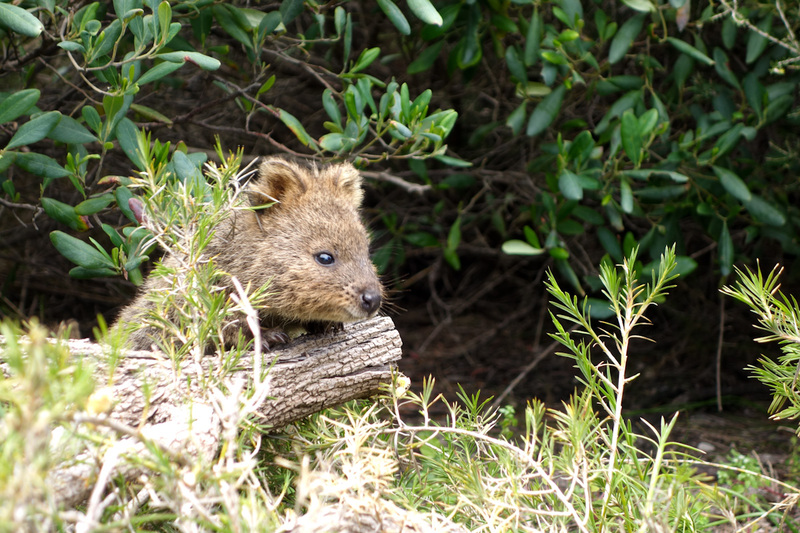 Ridiculously cute quokka at Rottnest Island. Other animals we met that day included a dugite (a venomous snake) by the side of the road - I didn't take a picture because I was paranoid that the click of the camera would trigger it to come after me, haha! 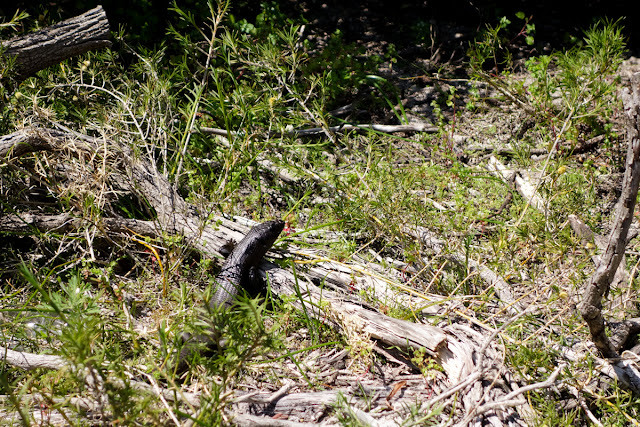 - and we also observed a few dark and glossy king skinks, I find them to be so sleek and handsome. A king's skink at Rottnest Island. Eventually we returned to the main town area of Rottnest Island, gave back our bikes, and strolled around looking for something to eat. If I recall correctly, we got the burnt caramel with salty caramel swirl and the rum and raisin at Simmo's, and both were delicious. 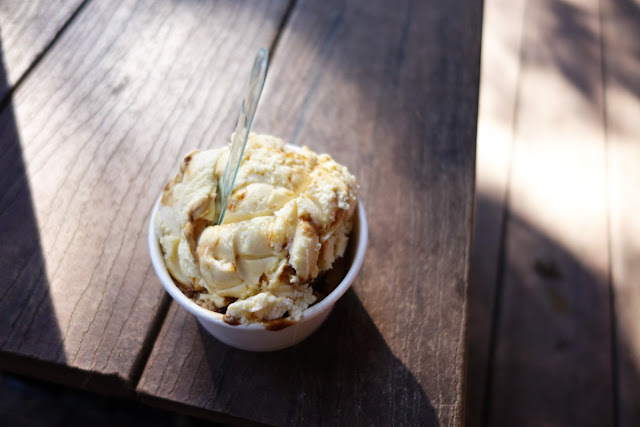 Ice cream from Simmo's Icecreamery at Rottnest Island. We also found a grassy area to sit down to eat our Subway sandwiches... and it was then and there that we found out that the Rottnest Island town area is where the naughty quokkas hang out and try to pry food off humans, and they can be quite aggressive about it! 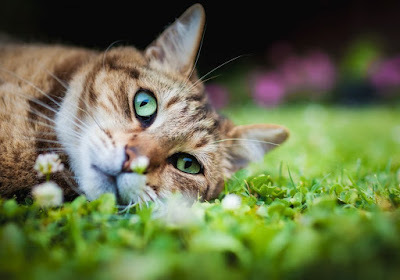 And look, I would love to share if I could, but giving them human food and even water is actually very bad for them, and can lead to not only an unnatural dependence but also cause health issues and reduce their lifespan, and they are a vulnerable species as it is. So don't feed the quokkas! We actually got involved in a full-blown tug-of-war with a belligerent quokka who wouldn't take no for an answer in our efforts to adhere to this rule, and while he may have managed to steal a nibble in the process, we won in the end. Sorry, quokka! We're just looking out for you! 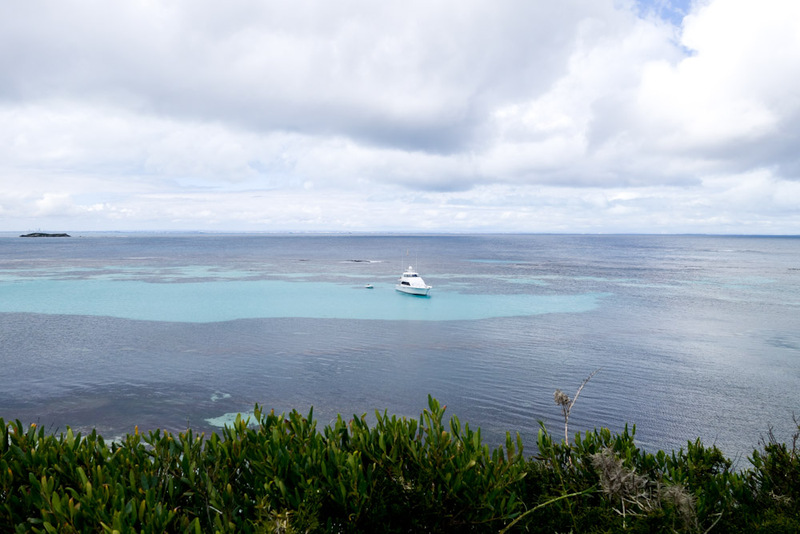 Boat and ocean - a tranquil scene at Rottnest Island. I am so glad that we did this day trip to Rottnest Island, and I would love to go back again someday. I'd heartily recommend it to anyone - if you live in Perth, or if you're visiting for a holiday - whatever. It's truly an iconic destination of Western Australia. What are your thoughts on Rottnest Island? Feel free to share in the comments section below! 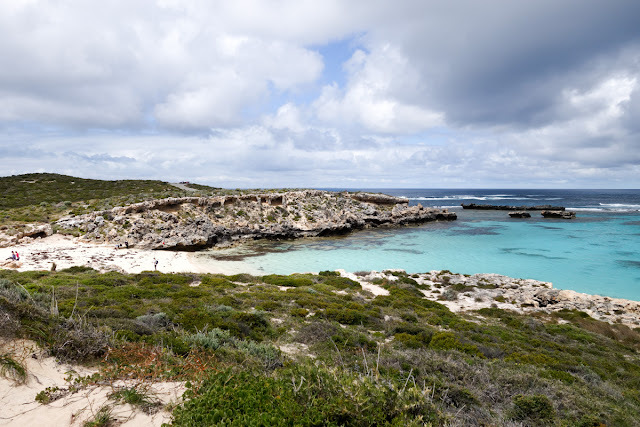 Michael and I visited Rottnest Island for the first time in September of this year! We did the same ferry/bike hire combo from Fremantle. We packed a picnic and had a wonderful time, I'd definitely go back again. Such a great place, isn't it? Yes, some of those quokkas are certainly not shy, haha! The little robber I mentioned in my post was all over us! I have good memories of Rottnest having gone there as a child a few times but...I've forgotten how beautiful it is. Nancy Cove and the Green Island are just so lovely. Oh I do remember how hilly it is though! At least there was ice-cream after all your efforts! It really is so stunning. Worth the tough bike ride, would be keen to do it again, even though I know I would complain about how tiring it is all over again, too. :p Maybe we'll splurge on an electric bike next time?! ?